“I probably get two or three requests a week from authors wanting me to endorse their books. This book was not one of those. I asked for the privilege of endorsing Melissa’s book. You might say, I practically begged. Here’s why: I wanted to be one of the first to preview this groundbreaking material. Melissa Joy and pretty much everything she says and writes about is sheer brilliance. Now available in Print, E-book, and Audiobook, narrated by the author. Available in Italian translation November 2018. Humanity is in a position that we have never been in previously, on new and unfamiliar terrain. You may be at a place in your own life where you are aware that “tried and true” behaviors and beliefs are no longer working. You may be unsure how to proceed. ~Why the notion that we create our own reality is only half true. ~Why heart-centered awareness is key to self-love, authenticity, completion, and transcending your stories. 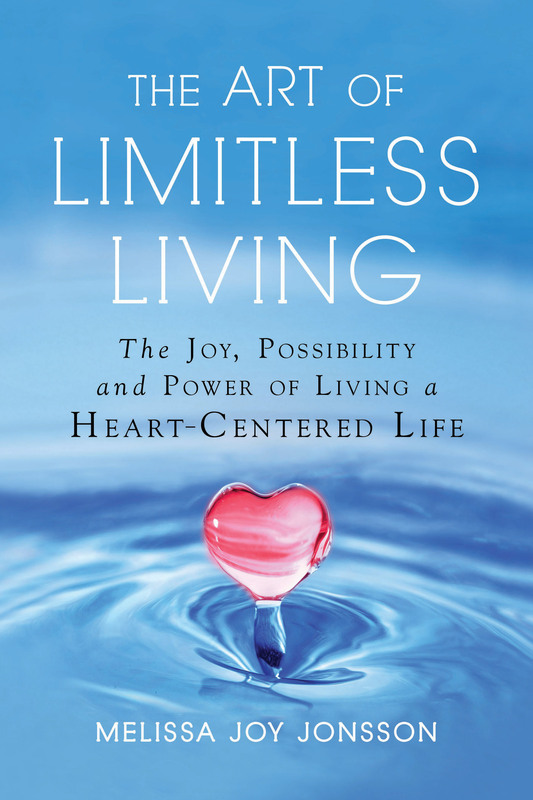 ~How to bridge the gap between limitation and limitless potential. ~How to leverage placeholders, heart-mind synthesis, and fluid boundaries. ~How to overcome problems with family, friends, work, and society. ~How to transcend addictions as distractions. Available in German and Italian translations. Available in Polish translation October 2018. LBOBP Audio Book is Now available. The full unabridged edition is lovingly narrated by author Melissa Joy. Immerse yourself in the sound/light experience of empowered interactive reality creation through 24 Fields of Love. Practical Play the Heart-Centered Way is Now Available! 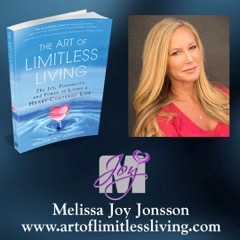 By best-selling author Melissa Joy Jonsson, Practical Play the Heart-Centered Way is a dynamic guide offering new ways to interact with a complete system of creating, relating, and embodying empowered, joy-filled, extraordinary living. Through simple, easy-to-understand explanations, combined with practical exercises, this playful book can change the way you relate to everything. 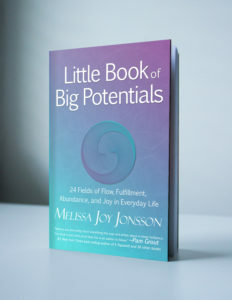 Practical Play the Heart-Centered Way is designed to support and enhance the M-Joy teachings shared in the popular life-transforming book Little Book of Big Potentials: 24 Fields of Flow, Fulfillment, Abundance, and Joy in Everyday Life. Whether you apply this book as a stand-alone tool or employ it to augment the powerful experiential M-Joy teachings, gifts of awareness are contained herein that can significantly transform your life. 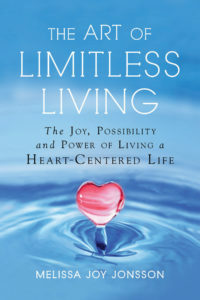 By brilliantly weaving language with symbolism, the author provides the ability to connect consistently to heart-centered awareness and True Authentic Self (TAS) and to experience True Authentic Relating (TAR) in everyday experiences. Discover the power of commanding field flow. Join Melissa Joy on a journey into the heart of it all, as she guides you in connecting easily to 24 Fields of Love shared in this concise guidebook. Integrate self-love as authenticity and integrity to effectively engage in interactive reality creation. Dissolve limitations and evolve awareness to a new reality based on unity and limitless potential for the individual as a whole part of the collective WE experience. Available in Print Edition, Kindle, and AudioBook, lovingly narrated by the author. Available in German, Russian, Italian and Polish translations. A Practical Manual For Extraordinary Living – Take a brilliant journey into the nature of change and reality to discover the power you have within you to transform. Join inspiring transformational leader Melissa Joy for a playful exploration into universal consciousness and infinite potential, available to everyone within the field of the heart. With beautiful and clear articulation, combined with a humorous weave of science, spirit, and practical play, Melissa Joy reveals how universal consciousness and infinite potential are organized and influence experiences. By practicing heart-centered awareness and freedom of choice, through the power of grace, anyone can navigate practically through life’s situations and challenges to experience more flow, joy, and personal fulfillment. The field of the heart is a portal to personal power, individual change, and global transformation, and it will lead you to a new reality based in unity, love, and limitless potential. Take a brilliant journey into the nature of change and reality to discover the power you have within you to transform. Join inspiring transformational leader Melissa Joy for a playful exploration into universal consciousness and infinite potential, available to everyone within the field of the heart. With beautiful and clear articulation, combined with a humorous weave of science, spirit, and practical play, Melissa Joy reveals how universal consciousness and infinite potential are organized and influence experiences. By practicing heart-centered awareness and freedom of choice, through the power of grace, anyone can navigate practically through life’s situations and challenges to experience more flow, joy, and personal fulfillment. The field of the heart is a portal to personal power, individual change, and global transformation, and it will lead you to a new reality based in unity, love, and limitless potential. The field of the heart is the physics of miracles. The field of the heart is the physics of love.